Businesses are going solar in Florida. 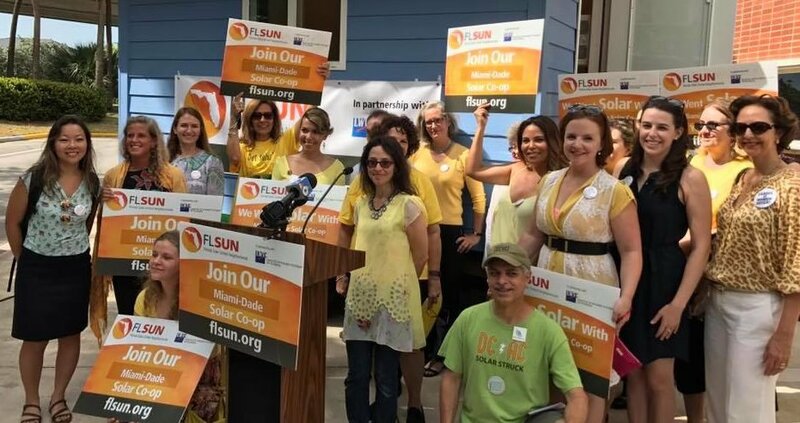 Our local business directory helps solar homeowners and supporters connect with businesses in the Sunshine State that are solar advocates in their own right. Members of Solar United Neighbors receive periodic coupons to businesses that have gone solar in their state. Accusoft 4001 N Riverside Dr Tampa, FL 33603 (813) 875-7575 Accusoft offers a robust portfolio of document and imaging tools created for developers. Our APIs and software development kits (SDKs) are built using patented technology, providing high performance document viewing, advanced search, image compression, conversion, barcode recognition, OCR, and other image processing tools for use in application and web development. Astaldi Construciton Corp. 8220 W State Road 84 # 300 Davie, FL 33324 (954) 423-8766 Astaldi Construction Corporation is the US Subsidiary of Astaldi SpA (www.astaldi.com), leading general contractor and one of the major players worldwide, ranked 59th in 2012 ENR Top 225 International Contractors, with 90 years of relevant experience in design-build of large infrastructure projects in the sectors of transportation (railways, subways, bridges, highways, airports, seaports), water & energy (dams, hydroelectric power plants, water supply networks, WWTP), buildings and P3/Concession projects. Day and Evening Pet Clinic 511 Magnolia Ave Palm Harbor, FL 34683 (727) 785-7200 Whether your pet needs a surgical procedure, vaccines, a rabies license, flea, tick or heartworm preventative, our highly trained veterinarians and knowledgeable staff are ready to give you instant, friendly service to help you and your pet. Elliott Museum 825 NE Ocean Blvd Stuart, FL 34996 (772) 225-1961 Featured Business: Read about Elliott Museum here! Miami, FL 33196 (305) 247-8847 We are a South Florida family-owned market providing fresh produce, homemade breads and pies & much more. First Green Bank 1391 Citrus Tower Blvd Clermont, FL 34711 (352) 483-9700 As one of the first banks in the United States which has an environmental and social mission, First Green Bank was founded in 2009 by a team of experienced and successful local bankers after being given the last bank charter in the state of Florida. St. Petersburg, FL 33716" (727) 584-8626 Great Bay Distributors, Inc., founded in 1968 by Claude Focardi and family, is Florida’s largest independently family owned distributor of Anheuser-Busch products. Great Bay has rapidly become a leading wholesaler in the beer industry – distributing six of the top 10 beers in the Pinellas, West Pasco, Hernando and Citrus county markets.ceilings, rough-carpentry such as doors/frames/hardware, masonry, and concrete. Ikea- Miami 1801 NW 117th Ave Miami, FL 33172 (888) 888-4532 The IKEA vision is to “create a better everyday life for the many people”. This has been Ingvar Kamprad's mission since 1943. Our business idea supports this vision by offering a wide range of well-designed, functional home furnishing products at prices so low that as many people as possible will be able to afford them. This is the idea at the heart of everything we do, from product development and purchases to how we sell our products in IKEA stores globally. Ikea- Sunrise 151 NW 136th Ave Sunrise, FL 33325 (888) 888-4532 The IKEA vision is to “create a better everyday life for the many people”. This has been Ingvar Kamprad's mission since 1943. Our business idea supports this vision by offering a wide range of well-designed, functional home furnishing products at prices so low that as many people as possible will be able to afford them. This is the idea at the heart of everything we do, from product development and purchases to how we sell our products in IKEA stores globally. JJ Taylor Distributing- Florida 2040 Park 82 Dr Fort Myers, FL 33905 (239) 267-1006 J.J. Taylor Distributing Florida, Inc. currently distributes beer brands from 85 domestic, craft and import suppliers, serving more than 10,000 retail customers in 17 Florida counties. Our goal is to market our company and the many brands we distribute by striving to be the premier FIRST CHOICE distributor and creating a unified online brand presence. LEGOLAND Florida Resort 1 Legoland Way Winter Haven, FL 33884 (877) 350-5346 LEGOLAND® Florida Resort is built for kids. The 150-acre interactive theme park offers more than 50 rides, shows and attractions, restaurants, shopping, a breathtaking botanical garden and the LEGOLAND Water Park all geared to families with children ages 2 to 12. The LEGOLAND Hotel is located just steps from the park entrance and features 152 rooms. Maitland Tire 233 N Orlando Ave Maitland, FL 32751 (407) 539-0800 Founded in 1995 by Rob Lesperance, Maitland Tire Company is your hometown independent dealer for tires, maintenance and repairs. From oil changes to engine swaps we want to be your go-to place for answers to your car questions. Residence Inn 2835 Tigertail Ave Coconut Grove, FL 33133 (305) 285-9303 Designed for both business travelers and vacationers, Residence Inn Miami Coconut Grove provides a refreshing extended stay. Delight in our top-notch location amidst dazzling beaches, shopping and dining in the Coconut Grove neighborhood. Miami Childrens Museum 980 MacArthur Causeway Miami, FL 33132 (305) 373-5437 The museum offers interactive exhibits, programs, and learning materials related to arts, culture, community and communication. MCM encourages visitors of all ages to play, learn, imagine, and create together. Miracle Toyota 37048 US Highway 27 Haines City, FL 33844 (863) 956-1123 At our dealership, we have devoted ourselves to helping and serving our customers to the best of our ability. We believe the cars we offer are the highest quality and ideal for your life needs. Roundhouse Creative Studio 1980 Central Ave St. Petersburg, FL 33712 (727) 954-8880 Featured Business: Read about Roundhouse Creative here! Suncoast Credit Union 14021 Palm Beach Blvd Fort Myers, FL 33905 (800) 999-5887 Our mission is simple — to improve the quality of our members' lives by maintaining a strong, secure and innovative credit union that builds trust, shows respect and maximizes efficiency. Swamphead Brewery 3650 SW 42nd Ave Gainesville, FL 32608 (352) 505-3035 Featured Business: Read about Swamphead Brewery here! TD Bank 665 NW 62nd St Fort Lauderdale, FL 33309 (954) 202-6900 Discover what it means to Bank Human™ again at America’s Most Convenient Bank. Let's talk. We're here everyday 6am–11pm EST. Homestead, Florida" (305) 245-2146 Unity is a family owned grower, packer, shipper operation that provides top quality tropical and Ethnic Specialty produce across the country. Our goal at Unity is to provide top quality produce and services while maintaining the family values that have made us successful. We strive to keep our company with relaxed core values and cutting edge thinking to keep us a head of our competitors. Whole Foods Miami Beach 1020 Alton Rd Miami Beach, FL 33139 (305) 938-2821 Who are we? Well, we seek out the finest natural and organic foods available, maintain the strictest quality standards in the industry, and have an unshakeable commitment to sustainable agriculture. William C Huff Moving and Storage 4227 Progress Ave Naples, FL 34104 (239) 263-8081 William C. Huff Companies is committed to simplifying the complicated maze of moving and storing your priceless possessions. With over 40 full-time, tenured and highly trained staff, you can be assured that your move will be handled smoothly and professionally, from the first phone call until the last box is unpacked. FL House Institute 4454 Beneva Road Sarasota, FL 34233 (941) 924-2050 Featured Business: Read about Florida House Institute here! Affco Deli Provisions 2577 25th Ave N St. Petersburg, FL 33713 (727) 327-5052 We feature changing exhibitions Authorized Purveyor of Boar's Head Brand Delicatessen products in South Pinellas. Sarasota, FL 34236 (941) 388-4441 Mote Marine Laboratory & Aquarium is an independent, nonprofit marine research institution comprised of world-class marine scientists committed to the belief that the conservation and sustainable use of our oceans begins with research and education. Support Solar Rights in Florida! Solar energy empowers Floridians to harness clean local energy, creates jobs, and enhances our energy security. Sign our petition to grow solar in the Sunshine State.